As you know, I’m honored to be a teacher by day. An esteemed student recommended this book to my class, and he made it sound so exciting, so imaginative, and so flat-out fun that we all wanted to read it. I ran to my local library and picked up a copy as soon as I could. Perhaps the most astounding thing about Snow Crash is that it debuted in 1992. In many ways, this book is downright prophetic in regards to technology, specifically the internet. It absolutely nailed what was then considered the near future. I dare you to read this book and not see a world that came to realization. The plot is … complicated. Hmm. How best to succinctly explain? Okay, here goes: Hiro Protagonist is an underachieving hacker who spends his days delivering pizza for the Mafia. However, he’s also a master swordsman responsible for much of what’s called the Metaverse, which is what we would call a world of virtual reality. There’s a new virus attacking those most adept at coding, especially hackers. It’s called Snow Crash. However, this virus may not be new — it may be the remnant of something from Biblical times. There’s so much more, but that’s the driving thread of the book. Every single sentence in this book made me work, and I mean that as a compliment. It’s so unique, so original that the reader cannot take a single word off — it demands your concentration at all times. My only complaint is that the book seems to end rather abruptly compared to the epic tale preceding it. Frankly, the ending struck me as almost anticlimactic, but that seems fairly consistent with the author’s sensibilities. Mr. Stephenson seems like a writer that refuses to follow convention, especially when it comes to endings. Some books require no necessary rereads. Snow Crash is NOT one of those books. I intend to read this book again, and probably a third time as well, in order to fully grasp it. 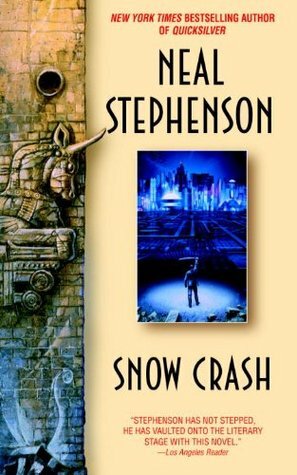 If you’re looking for something completely unique and unlike virtually anything else you’ve ever read, I suggest Snow Crash. Though it will remind you of The Matrix and Ready Player One, you must remember that this came first.